Whole grains like Barley are becoming more and more popular because of the rising health concerns these days. They are a great source of dietary fibre, minerals and vitamins. 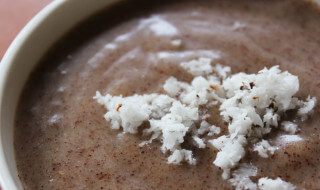 This Barley Porridge recipe along with milk is a great and healthy alternative to sweet dishes. Soak the barley in 3/4 cup water for 1 hour. At the end of the hour, add the remaining 3 1/2 cups of water to a saucepan along with the cinnamon stick, cover pot and bring to a boil. Add the soaked barley as well as the soaking liquid to the boiling water and cook on medium heat for 30 minutes or until the barley is soft. Remove the pot from the heat and sweeten with sugar and milk to taste, stirring until fully incorporated.